Click here for a printable PDF version of the Assembly Instructions that follow. Assembly is very simple. We ship the parts with the nuts and bolts already in the assembly holes. There are only 4 main parts. Attach the components as shown in these pictures and described next. You can tighten the nuts with a 7/16” wrench or socket (preferred), or use a pair of pliers if you don't have a wrench. 1) Secure the funnel to the base (3 bolts and nuts). Place a washer on the bolt so the washer is against the fiberglass. No washer is needed against the plastic on the inside of the base. Reach in through the door to affix the nuts. 2) Mount the ramps to the funnel (4 bolts and nuts). Do not use a washer on the bolt, but place one next to the nut on the underside of the funnel against the fiberglass. Finger-tighten all 4 bolts, then tighten with a wrench so that the square shoulders of the carriage bolt are pulled down into the white plastic launch ramp feet. They finally need to be tight, but not so tight that they break the plastic. 3) Remove the protective film from the sign frame. 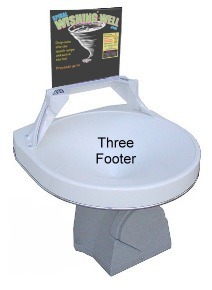 (If you have received a Three-Footer, the sign frame is packaged UNDER the funnel in the bottom of the box.) Affix the name or logo of the proceeds recipient to the paper sign under where it says, "Proceeds go to", or you can make a whole new sign and slip it into the clear frame if you choose. If you will be changing the recipient from time to time, you will want to affix it with removable double-sided tape or very small pieces of other clear tape. Since it is inside the clear plastic sign frame, it will not need very much adhesion. Mount the sign frame on the back of the ramps as shown (2 screws). Place a large washer on the bolt which goes through the back side of the sign frame, and use a small washer next to the nut on the inside of the cross-bar. 4) The door slips into place and is secured by the padlock as shown in this picture. 5) The floor is already installed in the base. 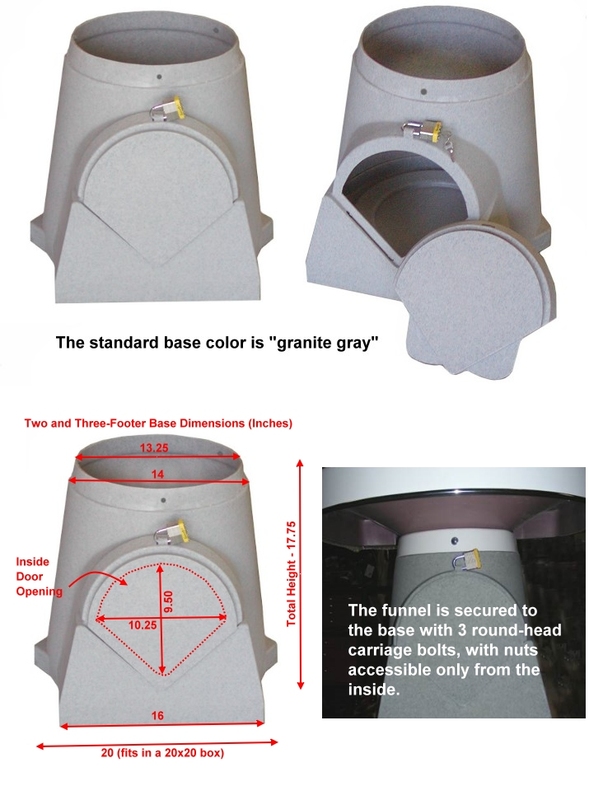 If you purchased multiple Wells, the floor is only in the base on the bottom of the stack. You can use it as a sample for correctly installing the bolts and nuts for the rest of the bases. Check all screws regularly to make sure they stay tight. Cleaning Your Well: We recommend that you clean your Well regularly. A clean Well attracts more revenue. Use any common household glass cleaner such as Windex and a soft cloth. For very stubborn marks or stains, you can use Acetone on the fiberglass only (NOT ON THE RAMPS OR STICKERS). Scratches: If you get scratches on the fiberglass, you can polish them with any automotive polish. If they are too deep for polish, you can use "rubbing compound" followed by polish. Coin Jams: It is possible for coins to jam in the to of the launch ramps...especially if people drop in more than one at a time. There is a hole in the coin-slot cover through which you can usually unjam the coins by hand. But if that is not possible, you will need a poker of some kind. A large paper clip , short piece of wire, or a very small flat-blade screwdriver works great. Some customers keep a paper clip or wire hooked to their padlock so it is always handy. If you place your Well in a public location where you are not able to check it periodically, we suggest you provide a poker to someone who will keep their eye out for coin jams. Security, Collecting Coins, Counting Coins and much more is on this page. Please send pictures and reports: We would love to see pictures of your Well(s) along with an income report after a period of time. Please send it to sales@divnick.com. Be sure to look at our "Event Strategies and Promotions" which are a great way to have a grand-opening kick-off with your Spiral Wishing Well. Events can motivate people to do extraordinary things and can generate several thousand dollars and a lot of excitment. The one-day record is $40,979! May the coins pour in!